UVA researchers join team in finally determining the exact site where 19 accused witches were executed during the Salem Witch Trials. It’s an inconspicuous spot: a rocky outcropping next to a Walgreens pharmacy, in the midst of a quiet residential neighborhood. Researchers now know that Proctor’s Ledge was one of the most conspicuous spots in Salem, Massachusetts more than 300 years ago: the site where 19 accused witches were executed during the notorious Salem Witch Trials. University of Virginia religious studies professor Benjamin Ray is one of five researchers leading the Gallows Hill Project, which announced its discovery last week to significant national attention. Ray, author of “Satan and Salem” (University of Virginia Press, 2015), oversees UVA’s Salem Witch Trials Documentary Archive and Transcription Project, the most comprehensive digital archive of primary source materials from the trials. 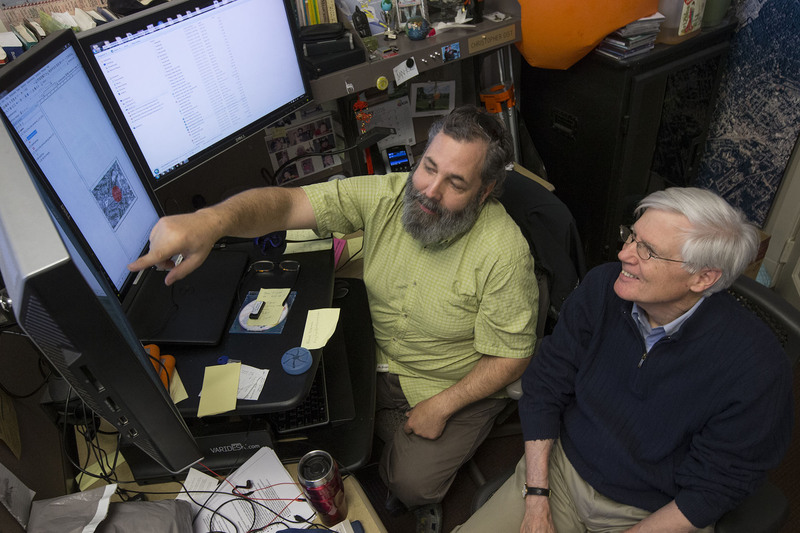 He worked with Chris Gist, a Geographic Information Systems specialist in Alderman Library’s Scholars' Lab, to digitally map the area and help confirm earlier research pinpointing the execution site. To identify the site, the researchers combed through maps, court documents and other primary sources, hoping to determine the location of “the house below the hill.” That phrase, discovered among nearly 1,000 pages of court records by researcher Marilynne Roach, was uttered by 51-year-old accused witch Rebecca Eames during her preliminary examination on Aug. 19, 1692. The magistrate asked if she had witnessed the five executions that occurred earlier that day and Eames responded that she was at “the house below the hill” when she saw the executions. (Appropriately, one of those executed that day was 60-year-old tavern keeper John Proctor. Proctor’s Ledge was named after one of his descendants). The team determined that Eames was referencing a house on Boston Street, most likely the house owned by the McCarter family. Boston Street was the main road that led into the courthouse and was across from several acres of public land, now called Gallows Hill. 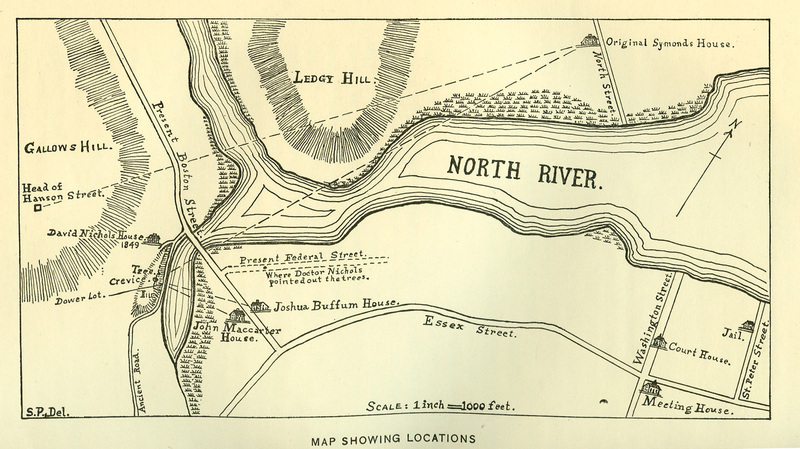 Researchers knew the executions took place on Gallows Hill, but they did not know exactly where. 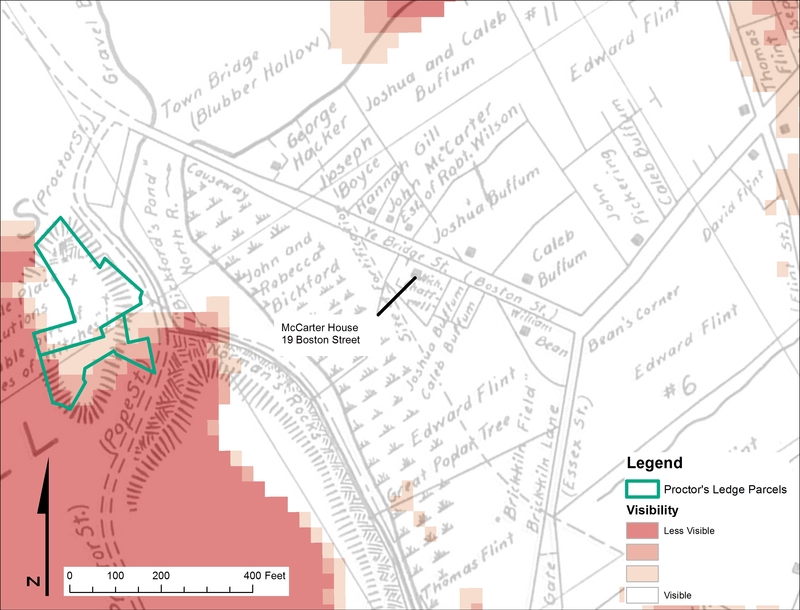 To find out, Ray and Gist analyzed maps of Salem drawn by early 20th-century Salem historian Sidney Perley, using technology that Perley lacked – the geographic information system software in UVA’s Scholars' Lab. The Scholars' Lab, which includes GIS specialists, has expanded rapidly over the last eight years to provide digital mapping resources to projects across Grounds. 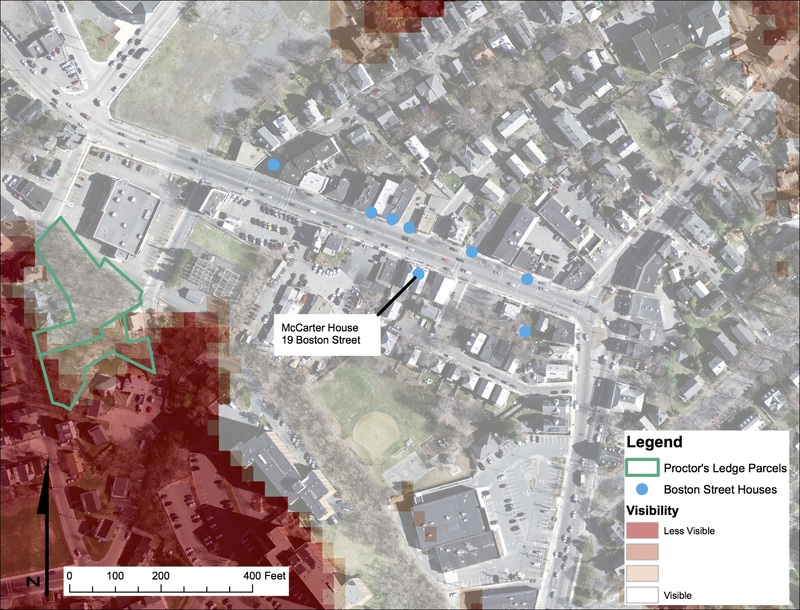 Using current topographical analysis, historical maps and aerial photos, Gist created a viewshed analysis of the topography surrounding Boston Street and Gallows Hill to determine which ledges on the side of the hill would have been visible from the houses on Boston Street. “We were able to spatialize history to gain more evidence and deepen the historical narrative,” Ray said. “We wanted to know which house Rebecca Eames was likely in and whether she was telling the truth. She had been deliberately lying in other parts of her testimony, confessing that she was a witch to save herself from the gallows. How could we be certain that she could see the executions, as she testified, from any of the nearby houses? Gist’s analysis confirmed that Proctor’s Ledge would have been the most visible site from Boston Street and from the western part of the city in 1692, making it a prime location for city officials eager to make examples of those being executed. Proctor’s Ledge was also the most easily accessible site outside of the city boundary. Ray and Gist analyzed the likely route for transporting prisoners from the prison in the center of Salem to Proctor’s Ledge. It was high enough to be seen prominently, but not too high to be reached by cart. Once they identified the site, Peter Sablock, a geologist at Salem State University, conducted extensive analysis using ground-penetrating radar. They discovered no relics or human remains and found that there is less than three feet of soil on Proctor’s Ledge –not enough to bury victims’ bodies in the ledge’s small crevices. This is consistent with oral histories recounting that families of the victims returned to the execution site at night to recover their loved ones’ bodies dumped in the crevices and rebury them in family cemetery plots. There was also no trace of a gallows structure, confirming that victims were most likely hanged from a tree, as was customary at the time. The research team was also able to share its findings with Salem Mayor Kim Driscoll and other city officials. Salem is now planning a small memorial for the site, which is owned by the city and located in a heavily wooded, residential area. A clip from a documentary – “Gallows Hill – Nineteen” being developed about the Gallows Hill Project. (Video provided by Tom Phillips, G Street Productions, LLC).